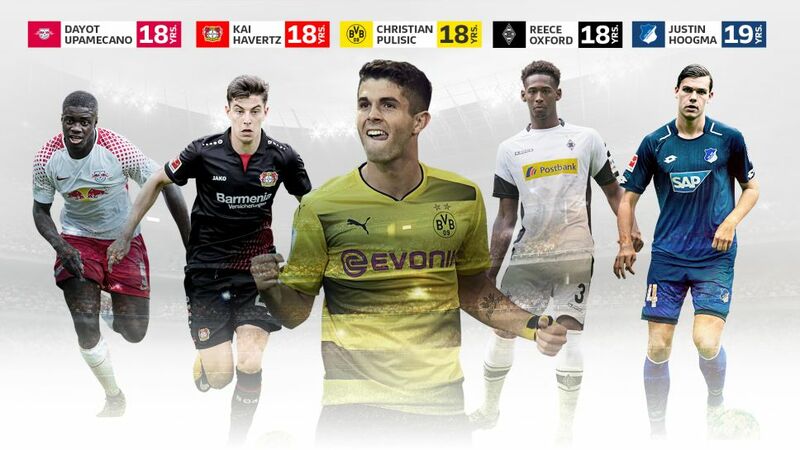 Upamecano, Havertz, Pulisic, Oxford and Hoogma (l-r,) are the brightest young players in the Bundesliga who have yet to see their 20th birthday. Every season, without fail, the Bundesliga unearths a handful of youngsters with such prodigious talent they can no longer fly under the radar. Julian Brandt, Mario Götze and Mahmoud Dahoud are just some of the names to have taken a whirlwind route to the top in recent years. Much like Gladbach, Hoffenheim have big boots to fill in defence following Niklas Süle’s summer move to Bayern Munich. In Justin Hoogma – the son of Nico-Jan Hoogma, whom made 177 Bundesliga appearances for Hamburg between 1998-2004 – the Sinsheim club may have found the ideal long-term replacement. A season-long loan signing from West Ham, Oxford brings Premier League, Championship, FA Cup and youth international experience to the Gladbach rear-guard. The 18-year-old has already been talked up as a future England captain, but desperately needs the playing time to further his development. Step forward Gladbach. A club who made a man out of Chelsea defender Andreas Christensen, the Foals have a knack for allowing precocious talent to prosper. Oxford - a ball-playing central defender, whose 6’3” frame makes him an invaluable asset at both ends of the pitch - fits comfortably into that category. Upamecano made 12 Bundesliga appearances for Leipzig last season, but with Champions League football on the agenda in 2017/18 and veteran defender Marvin Compper not getting any younger, Bundesliga audiences could be about to see a whole lot more of the titanic 18-year-old in the months ahead. Physically, with his raw power, pace and no-holds-barred approach to defending, he is a match for anyone. And despite some teething troubles early on, the Frenchman proved himself a highly capable deputy to injured captain Willi Orban during the back end of 2016/17. His potential, like his physique, is colossal. Harnessing his inner Michael Ballack and Mesut Özil, Kai Havertz took to the Bundesliga like a duck to water in his breakthrough campaign in 2016/17. He became Leverkusen’s youngest ever Bundesliga debutant and goalscorer, made 24 Bundesliga appearances and took his UEFA Champions League bow at Wembley - all whilst studying for his high-school finals. At youth level, Aachen-born Havertz excelled in central midfield, plundering 27 goals in 59 outings for the Leverkusen juniors. Since making the step up to the first team, the 18-year-old has thrived in a freer role on the flanks, netting four times last term. Testament to his work ethic and prodigious talent, Bayer’s boy wonder was kitted out with his first professional contract in the summer. There is no better player to forge Leverkusen’s future. An established Bundesliga force in his own right and still only 18, Pulisic is on a one-way ticket to the pinnacle of the game. Such is his progress since making his Bundesliga debut under Thomas Tuchel in February 2016, he is now considered an essential cog in the Dortmund machine – not to mention the USMNT’s proverbial great white hope. He combines pace, skill, vision and a refined nose for goal with the ability to deliver on either flank or through the middle, and has already struck up a devilishly fruitful understanding with BVB teammates Ousmane Dembele and Pierre-Emerick Aubameyang. Make no bones about it, Pulisic is the one to put the USA on the world football map. Click here to read Part I, players 20-16! Click here to read Part II, players 15-11! Click here to read Part III, players 10-6!